Naturally, suffering as I do from Out-of-Africa-itis (some of you may just have noticed this) any mention of ‘wild’ instantly conjures the sweeping Mara grasslands and herds of wildebeeste. Or scenes of Zambia’s South Luangwa as featured in the last post (here). But then I thought it was time I took more joy in the place where I actually live and, indeed, grew up – the wonderfully rural county of Shropshire. And for those of you who do not know England, Shropshire is in the Midlands, along the border with Wales. Also as I have mentioned in other posts, this segment of Great Britain was once (400 million years ago) to be found somewhere off East Africa. Shropshire’s rocks are thus among the world’s oldest, and its hills a magnet for geologists from all over the planet. My home county, then, is largely farming country – dairy, sheep, and arable – the population living in scattered small settlements and market towns, many dating back to Roman times and the early Middle Ages. But there are also many wild places, especially up in the hill country overlooking Wales. 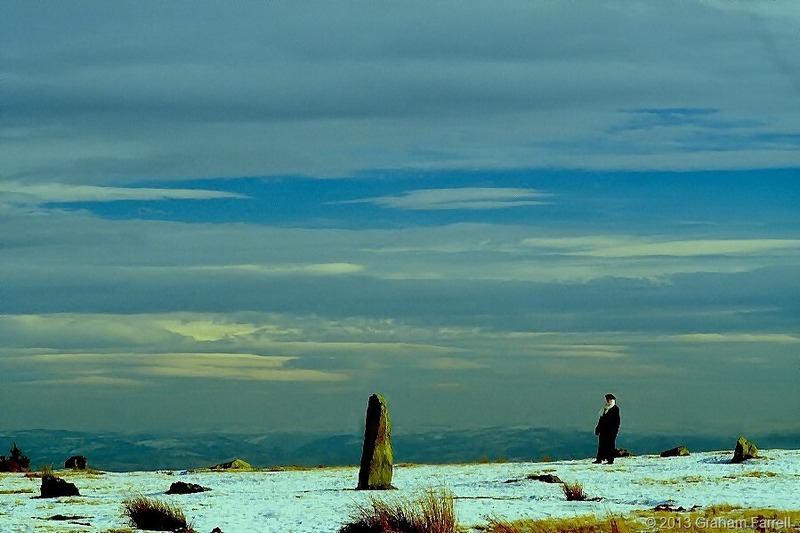 One such place is Mitchell’s Fold, a Bronze Age stone circle. This bleakly sited monument comes with a strange legend attached – the tale of a wicked witch and a fairy cow. And so one December day Nosy Writer and the Team Leader set off to explore. Winter seemed a good time to go searching for the spirits of the past. The photographs, by the way, are all Graham’s. Nosy Writer said she could not possibly take her gloves off in such frigid conditions. 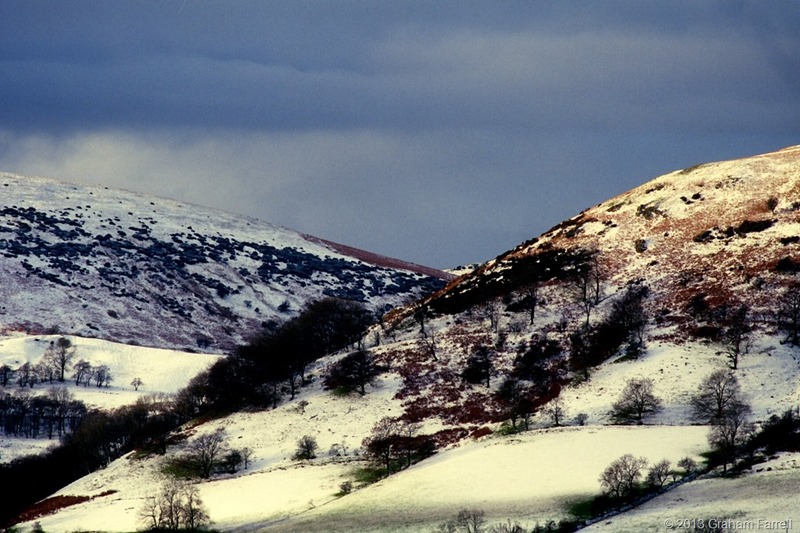 The site itself is near the Welsh Border on Stapeley Hill, south west Shropshire. 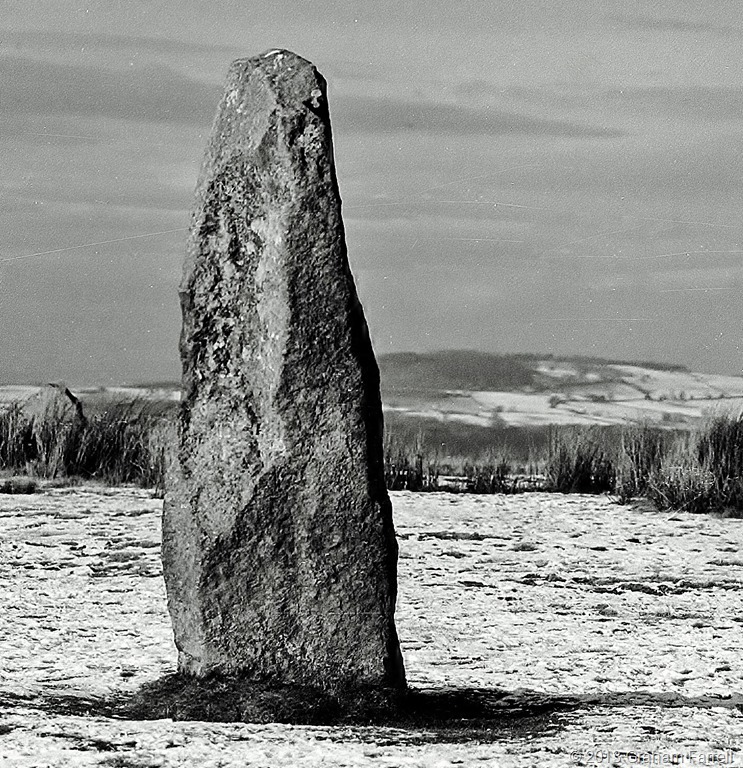 The stone circle was created between three and four thousand years ago, and originally comprised thirty stones of local dolerite. Today, only fifteen are visible. Some were perhaps re-purposed by subsequent generations; others buried. Often such circles were regarded with superstitious dread, particularly during the Middle Ages. In the prehistoric past, though, the place was not so isolated as it appears today. In the vicinity are two other stone circles, although one of these, known as Whetstones was blown up in the 1860s. The other, Hoarstones, was said by locals to be a fairy ring, where on moonlit nights, six ‘fairesses’ would dance. 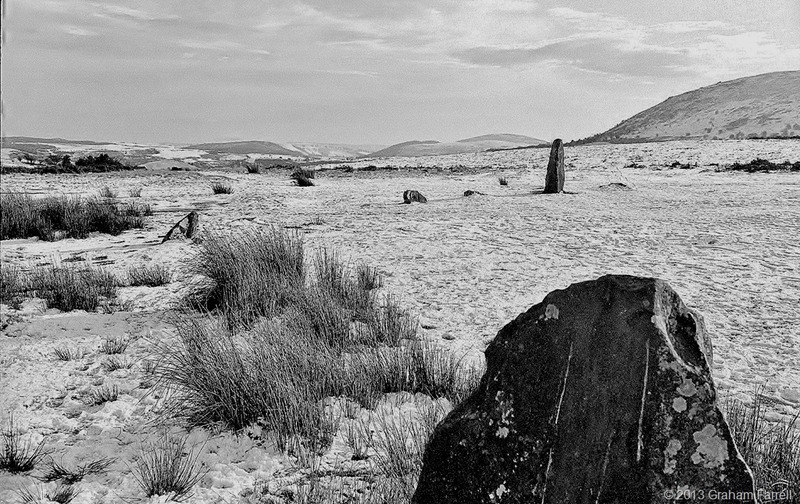 There are also numerous cairns and a long barrow, and, not too far away, the Bronze Age stone axe factory of Cwm Mawr whose finely carved mace heads were traded far and wide across England and Wales. Of the reasons for this and the other circles, all is shrouded in mystery. All that may be said is that once these upland places were of great importance to the people who laboured to make them. But what about the witch-catching story, I hear you ask. Well that I can tell you. It goes like this. Once, when there was a terrible famine in the district, the fairies took pity on the starving peasants and sent them a snow-white cow. The cow was kept in a circle of stones on Stapeley Hill, and, as with all such gifts, there were strict conditions as to usage. Every person was allowed to milk the cow by turns, but only so long as the cow was never milked dry, and each person took no more than one pail full. Everyone followed these instructions, and all went well until the wicked old witch who lived nearby grew envious of the peoples’ good fortune. Why had they not called on her to solve their problems? Her name was Mitchell, and out of sheer spite, she thought up an evil plan. And so one night, when all honest folks were asleep in their cottages, she approached the cow and began to milk it. The only thing was, the bottom of her bucket was full of holes. She milked and milked until the cow was dry, thus breaking the fairy charm. At once the cow sank into the ground, never to be seen again. But Mitchell did not escape either. She had challenged the forces of good too far and found herself trapped inside the stones. And when the people came next day and saw their fairy cow gone, and they saw the false pail and pool of wasted milk, they knew exactly what the witch had done. So just to make sure she never escaped, they walled up old Mitchell inside the stone circle, where she was said to have finally starved to death. And just in case you are wondering, no, this is not Mitchell’s ghost in the photo, but me, wrapped up in many post-Africa layers. 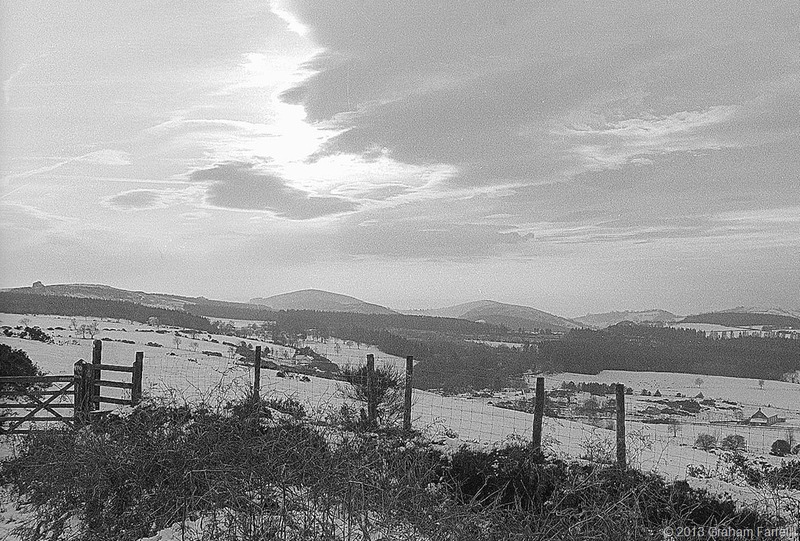 And beyond me, the Welsh hills. Finally, here are more scenes of Wild Shropshire – in particular, the hills known as the Stiperstones, which featured often in the novels of Shropshire writer, Mary Webb. 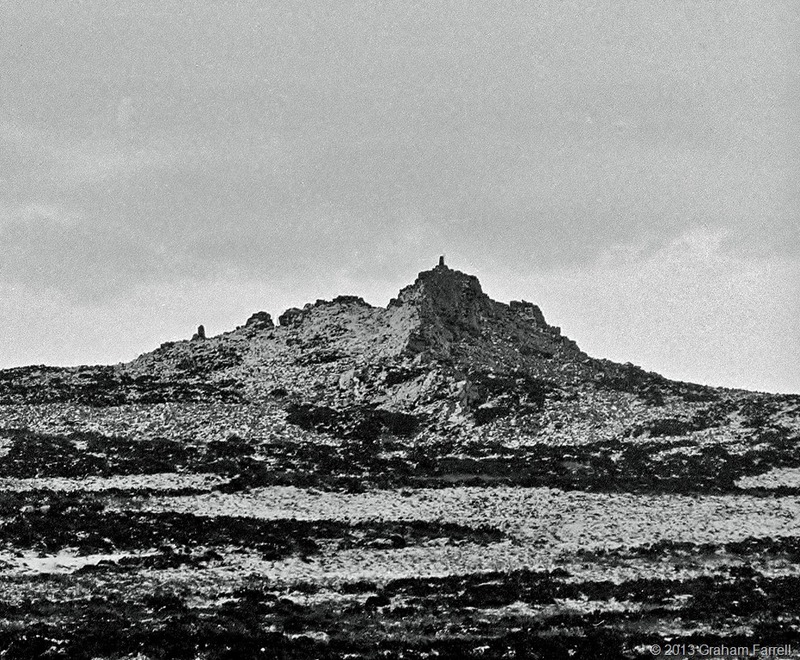 The last photograph is of the peak known as the Devil’s Chair. It also features many local legends, but they will have to wait for another post. 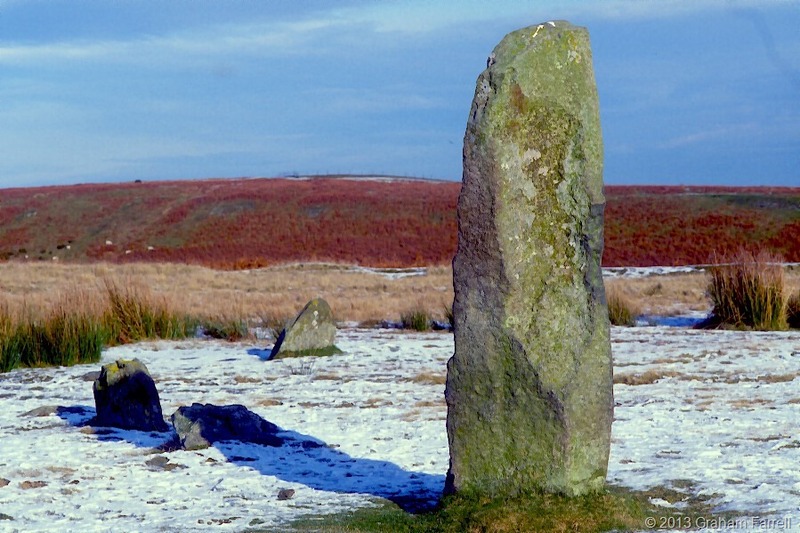 Posted on August 4, 2013 January 25, 2019 by Tish Farrell	This entry was posted in Archaeology, photography, Shropshire, Travel and tagged Bronze Age, folk lore, Mitchell's Fold, Shropshire Hills, stone circles, Tish Farrell. Bookmark the permalink. Little brothers, eh! Actually Mitchell has always struck me as a very odd name for a witch. Some sources say it derives from an old English word – megdel – meaning big. In other versions of the story there is a giant involved. So many mysteries. And of course, you are a history buff. Naturally. I lived in Jerusalem and I spent several months in Britain … England, Wales on one trip, Ireland on a different one. Old places … very old places … are full of ghosts or I think they are, anyway. Jerusalem is a giant tel …. I remember discovering the street corner where I used to buy buttons and zippers was the spot where David fought Goliath. My favorite spot in England was Glastonbury Tor because I was sure that Avalon was there, hiding in the wind. I think anyone who ever lived in another loved place far away … well, I dream of Jerusalem. Often. In Hebrew, which ironically, I can no longer remember enough to speak, but in my dreams, I know and understand it. Strange, how things are forever fresh in our dreams. Yes, the dream world. Interesting to think that our spirits live another life in there, and we only get to glimpse the fragments. It must have been fascinating to live in Jerusalem, and of course you don’t stop living in a place you’ve once been in, at least in some senses you don’t. I suppose the brain is a bit like a computer data base, where the conscious mind has lost most of the passwords to all we ever knew. Nice to talk. Yes, it’s a story that has often bothered me since our history teacher told it to us donkey’s years ago. It doesn’t show anybody in a very good light, apart from the poor beneficent milk cow. Oooooh! Creepy story about the witch Mitchell. I can’t wait to hear the one about the “Devil’s Chair”. I love the photographs. Great post! 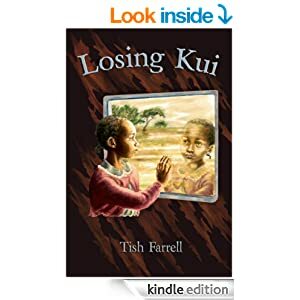 and to you, Tish, for telling the background stories! Thanks, Frizz. The team leader will be very pleased. He tends to hide his light under the proverbial bushel. now you could visit with your team leader STONEHENGE in U.K.! I can’t think of anything more to say than, I appreciated your story and team leader’s photos. I can’t think of anything more intelligent to say, I meant. I tend to write and click without stopping to edit. Shropshire is certainly blessed with walks. I was thinking of you just now as I walked up the fields behind our house and along Wenlock Edge. If you could get yourself to somewhere like Church Stretton on the train, (direct line from Manchester) there are places to stay in the town, and lots of walks up into the Shropshire Hills. And in the summer there’s a shuttle bus if you want to venture further afield. Brilliant Tish, I’ve always wondered about your header photo and I love the legends. Well spotted, sir – a landmark in my circular meanderings. And POETS indeed tho I haven’t even made a start today yet. All my tomorrows are turning into Saturdays. Damn! Happy weekend to you. Yes, may all your tomorrows turn to Saturday. I’m thinking that might be the slippery slope to total idleness. I might favor forever idleness over Mondays, however. Even to us non-salary earners, Mondays always seem to be Mondays. I p’raps shouldn’t tell you that. I remembered you liked it the first time around, Gilly.